Cardiovascular disease has been the major cause of death of human beings; fighting this number one killer has been an endless endeavor of physicians and scientists worldwide. Armed with updated knowledge and improved technology is a basic requirement for wining the fight. In the past few years, we have witnessed rapid evolution of a novel scientific field: micro RNA (miRNA) has entered the macro world of heart. Several milestones in this field are identified. In the year 2005, Srivastava’s group reported a critical requirement of miRNAs to cardiac development, being the first documentation of miRNA function in mammalian heart. In 2006, Olsen’s group demonstrated the causative involvement of miRNAs in cardiac hypertrophy; representing the starting point of miRNA research in adult heart. This was followed by another six original papers on the same topic in 2007. The third milestone is the discovery, by the collaborative effort from Wang’s laboratory and my laboratory, of miRNAs as regulators of cardiac excitability and the associated arrhythmogenesis and sudden cardiac death. To date, more than 400 original research papers on the role of miRNAs in cardiovascular physiology and pathology have been published and new discoveries in this field are now published on weekly basis. We have already had a wealth of information about miRNAs in cardiovascular function and disease and the interest in this subject is still rapidly increasing. There is apparently an urgent need to have a systematic summary of these research data beyond single review articles. The book, microRNAs and Cardiovascular Disease, written by Dr. Zhiguo Wang aims to provide such a summary, which is just timely and necessary. 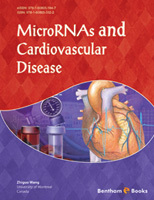 In this book, readers can find comprehensive reviews of diverse subjects related to miRNAs and the cardiovascular system, literature-exhausting collection of currently available data, up-to-date knowledge of potential pathophysiological implications, insightful and thoughtful analysis of existing questions and problems, etc. The book contains 18 chapters with the first two chapters on the basics of miRNAs and expression profiles of miRNAs in the cardiovascular system and the rest each focusing on a particular aspect of cardiovascular physiology and pathology and on the relevant technologies. The book, therefore, can be used as a reference book for researchers and professionals or as a textbook for university students. Cardiovascular disease remains the major cause of morbidity and mortality; according to statistics, heart failure, the syndrome consequential to many diseases of the cardiovascular system, is estimated to have a prevalence of 1–2% and an annual incidence of 5–10 per 1,000 in the developed countries and is the leading cause of hospitalization in the population over 50 years of age. Worse so, there is a clear tendency of increasing prevalence of cardiovascular disease in this planet particularly in the developing nations. This problem casts enormous health concern and costly socioeconomic burden worldwide. Improving our understanding in depth of cardiac pathophysiology and translating our updated knowledge into the clinical practice through the innovation of novel diagnostics and therapeutics has become the most urgent task of scientists and health professionals. We have entered post-genome era after the human genome project had been completed years ago. Only <2% of all transcribed bases of the entire human genome constitutes the genetic sequence encoding proteins and the rest of 98% accounting for ~70% of all genes carry the sequences for RNAs not encoding a polypeptide chain that was used to be considered for many years “junk DNA” of no physiologic function; proteins were generally assumed the sole biopolymer capable of regulatory function. Intriguingly, the proportion of transcribed non-protein-coding sequences increases with developmental complexity and is a better indicator of phylogenetic level than the number of proteincoding genes of an organism. It is now known that “junk DNA” encodes non-protein-coding RNAs (ncRNAs) that are involved in determining the expression of protein-coding genes by regulating the activity of that 2% of the genome. These ncRNAs include microRNAs (miRNAs), once ignored completely or overlooked as cellular detritus, which were discovered over a decade ago have recently taken many by surprise because of their widespread expression and diverse functions. The discovery of miRNAs challenges the central dogma of molecular biology that has be held since the latter half of the 20th century. This central tenet teaches the flow of genetic information: ribonucleotiac acid (RNA) functions either as infrastructure (a role performed by housekeeping species of RNA) or merely as an intermediate from the deoxynucleotide sequence of genomic DNA through the transcription process, housed within the nucleus, to the amino acid sequence of proteins, which are synthesized in the cytoplasm by the translation process. It has been firmly established that miRNAs play a central role in regulating the expression of protein-coding genes by translational repression at the post-transcriptional level. Since their discovery in 1993, the importance of miRNAs has steadily gained appreciation and now miRNA biology has exploded into a massive swell of interests with enormous range and potential in almost every biological discipline. microRNAs and Cardiovascular Disease aims to target a wide range of readers from graduate students to postdoctoral fellow and senior researchers involving cardiovascular and miRNA research fields in universities, research institutions, and pharmaceuticals. The contents of the book are also suitable for cardiologists and other health professionals, who are interested in updating their knowledge and utilizing miRNAs as a complementary and an alternative strategy for clinical diagnosis and therapy of human cardiac disease. It provides the most updated information on miRNAs in the cardiovascular system based on the literature available, along with focused highlight, detailed reanalysis, unbiased commentary, and rational speculation. The book is divided into five sections that contain a total of 18 chapters. The book begins with Section I introducing the basics of miRNAs and expression profiles of miRNAs in the cardiovascular system. From Section II to Section IV, each of the 14 chapters is focused on the role of miRNAs in an independent entity of cardiovascular function or disease. Each single chapter contains three subsections: introduction, main body, and reference. In addition, wherever appropriate, illustrations, flow charts or tables for easier and straightforward understanding of the contents are presented.